Happy Christmas Eve! Today is the day that our festivities start - we spend the day with Marcel's family (Mom, Dad, Aunts, Uncles, Cousins and his Nannie). I love this tradition - his family is a lot of fun. I hope you have fun plans for today as well! The card I'm sharing today is one I received from my friend Donna Wizniuk. I love how the creative way she used the Endless Wishes stamp set. She said that she lined all the images up on our large clear block and stamped them all at once! So easy. 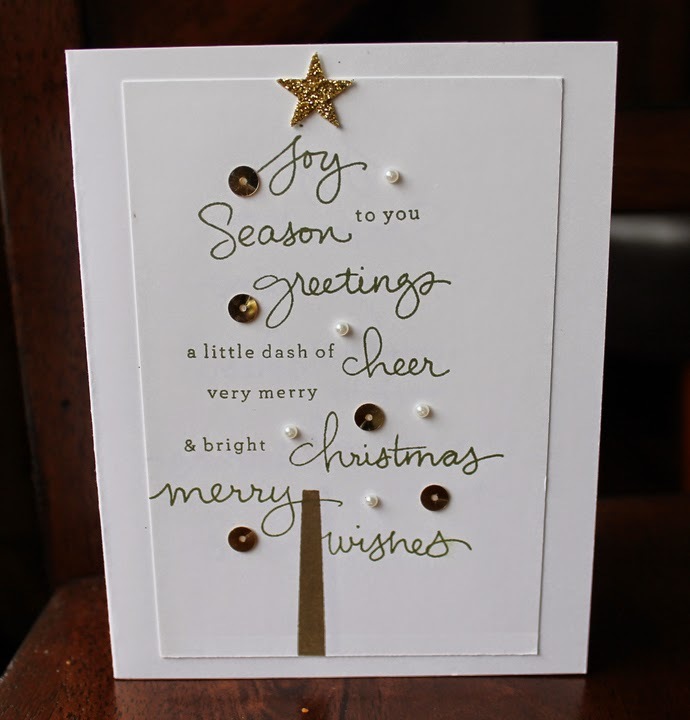 The stem of the tree is the ribbon from the Wondrous Wreath stamp set - pretty smart eh? I never did order this Endless Wishes stamp set and now I'm kicking myself because I'd love to make some of these for next year - so beautiful! This stamp set is another that is only available to order until January 5th. So sad to see this one go. It is a beautiful snowflake set.